Do you remember the first time you realized, “Uh-oh, how will someone get into this garment?” We’ve all been there. You drape a beautiful dress, you mark your drape expertly and then you realize as you are taking the drape from the form to pattern, “This one is going to demand a zipper. Ugh.” Believe it or not, the anticipation of having to set a zipper is far worse than the actual task. Trust us. Setting and sewing the perfect centered zipper – it’s almost a rite of passage into the fashion design big leagues – no more pins, velcro, glue or the like to hold your garments together. You are ready to create professional looking garments that are made with industry standards in mind. 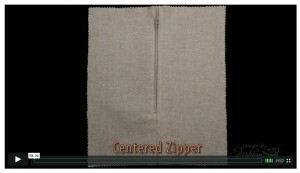 In our new video Centered Zipper, we give you all the tips and tricks you need to professionally close your garments. Once you have tried our method, there will be no stopping you in terms of garments you can create, and of course, close properly. There are many types of closures to garments – invisible zippers, exposed zippers, buttons and button holes, grommets, ties and the like. However, when you want a basic closure, one that is barely visible and will not take away from the design of your garment, the centered zipper is the way to go. Placed on the side seam, only the wearer will know it’s there. Placed at the center back, it blends right in with the center back seam. No matter where you choose to place your centered zipper, our video will help you make sure that your garment is free from puckers and the two sides of your garment joined by your zipper are matched evenly. Open up your design options considerably by becoming comfortable with setting a centered zipper. Spend some time close up with garments in your favorite boutique or department store and begin to recognize the various uses of the centered zipper – you will be grateful you did.